Welcome back to the Saturday edition of Satisfaction for Insatiable Readers...the place that will get things posted on the go despite a smartphone being less then smart right now. Yes, I am still in limbo on the phone front...hopefully when the battery arrives this week all is well (*fingers crossed*). Anywho, you didn't come by to listen to me whine about my phone...you came for some bookish fun and that's what I aim to provide. "ONLY LILY" & "LILY LEARNS"
Story two in the book tackles that day dreaded by parents and children alike...the first day of school. Exciting once you reach a certain age (especially with the new school supplies! ^_^) or if you are extremely outgoing child, but the separation issues that arise and feelings of abandonment can definitely leave everyone in a tizzy. Good thing Lily is such a sweetheart and encounters some great new friends and teachers along the way that help make her first day and those that follow go by in a flurry of nw activities and learning so that before she knows it, it's time to be reunited with mommy once again...and she's no worse for wear; in fact, she's an even happier version of her self. Does this happen with every child's first days of school? Sadly, no; but the more prepared we are both as children AND adults, the easier we can make that transition into a world of life long learning for all. 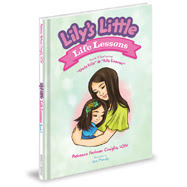 In short, a great new addition to the Lily series highly recommended for teachers, parents and the lucky little ones in your life. She'll bring a smile to your face, warmth to your heart and leave you with another way to enrich the lives of those around you. Add all of that to the WONDERFUL illustrations and you've got another reason to agree that Lily is Lucky indeed. Review copy received courtesy of the author. (THANKS!) For more information about this series as well as ways to reach Ms. Coniglio, seek out the official website or find her on Facebook. A very useful review, thanks. As our niece is about to put her son's name down for nursery school I'm sure book 2 will prove helpful. Great review! This sounds like an adorable series with great lessons!